I love whole baked chicken. I usually cook two so I can make several meals from the meat I pull off after the first round meal. 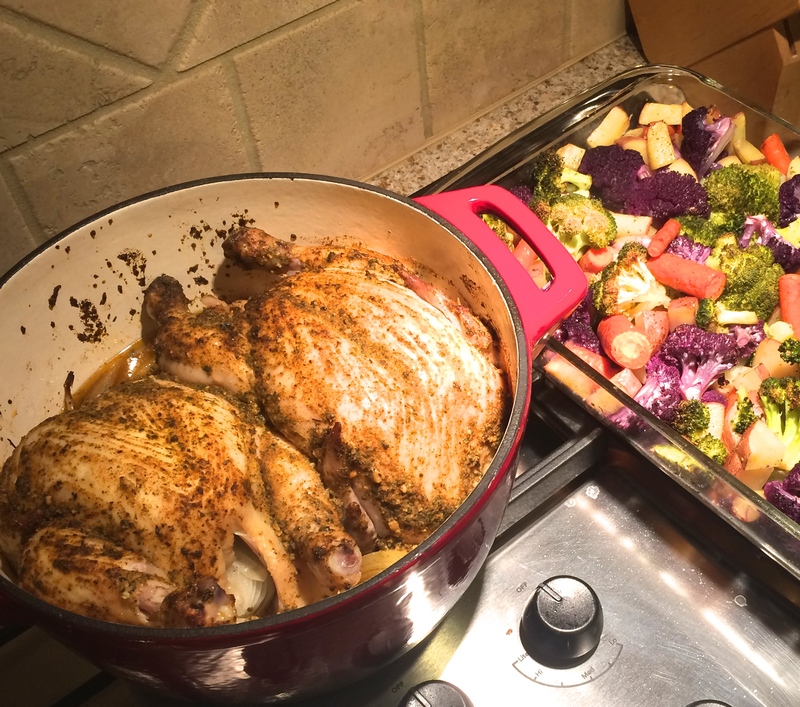 This is the recipe I always start with—two whole chickens and roasted veggies. 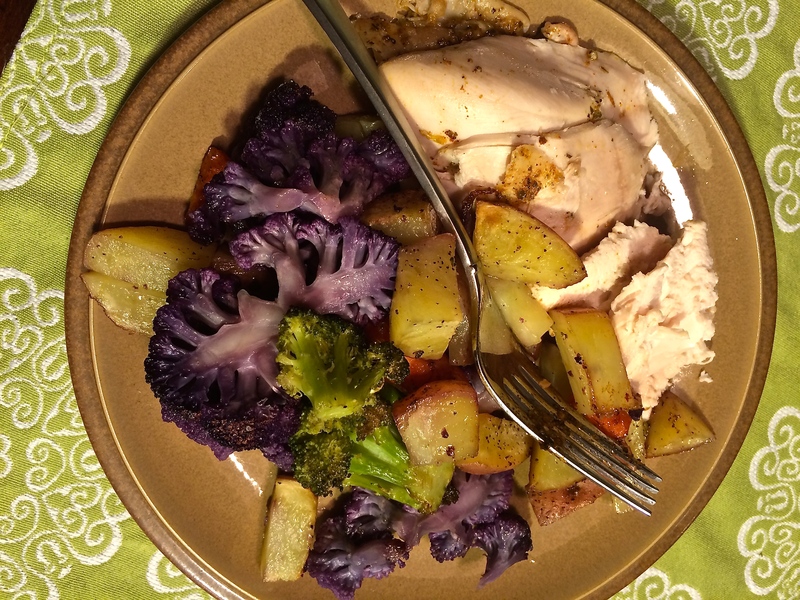 Adding fun colors like purple cauliflower or bright green romanesco makes the dish fun for kids and appealing for adults. Rinse chickens with cold water and pat dry with paper towels. Be sure to remove any giblets or neck pieces etc. Place the chickens in a cast iron pot breast side up. In the cavity of each chicken, place one of the quartered onions and three garlic cloves. Use a basing brush to combine the herb mix and melted coconut oil. Brush the herb mix over the two chickens. The coconut oil will solidify when cold, don’t be surprised by the filmy-look it gives the chicken. Place the lid on the pot and bake at 350 degrees Fahrenheit for an hour to an hour and a half (depending on the size of your chickens). Check internal temp with a meat thermometer to ensure doneness. After you take the chickens out of the oven, turn up heat to 425 degrees. Line a cookie sheet with foil and and place veggies on top. Distribute the olive oil evenly over vegetables. Toss to ensure even oil coverage. Sprinkle with garlic salt and pepper to preference. Bake for 20-25 minutes at 425. Enjoy! *Keep chicken covered while the veggies cook. It will stay warm and even continue to cook a little.